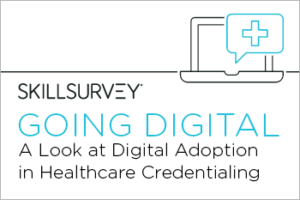 When it comes to digital adoption, a recent survey suggests that the world of healthcare credentialing is catching on. What was once a predominantly paper-based process for healthcare organizations, physicians, and advanced practitioners is now undergoing a shift toward automation. And this movement toward digitizing credentialing is having big impacts on many healthcare organizations. In this eBook, we take a hard look at the factors driving healthcare organizations to adopt new technology in their credentialing processes and how medical staff professionals are faring during the transition away from paper. Discover how MSPs and technology vendors are reimagining what is possible, driving organizations to become more innovative in the way they credential their providers.